I usually try to post a couple things every day. Yesterday, I was crazily trying to get ready for Lydia’s (my oldest daughter’s) party and it didn’t happen. Her cake, was by far the most time consuming. Baby woke up at 6 am and I worked like crazy until about 1 pm getting it done. If I wasn’t so amateur–it probably would have gone faster! She isn’t really crazed about any one thing. We looked at a variety of cakes and she thought the Barbie one looked fun. I actually remember my aunt Gail making one of these for one of my siblings long ago. I thought it was so pretty….so I found my cake decorating tips and turned to youtube for some cake decorating tips. You really can learn to do anything on youtube. I loved the flower making tutorials and how to make a ribbon. We ran into a few problems while making the cake. First, the pyrex bowl cake stuck even after ample PAM spraying and flouring the thing. Then, Barbie’s legs were too long–and I probably should have done another 9″ round cake to make it taller but didn’t want to as I had already invested 2 cake mixes in the project. Then, I ran out of frosting. Solutiions: We kind of stuffed the broken cake back onto the other part of the cake and frosted over it. Barbie’s dress became a mermaid style dress and I made some buttercream frosting to supplement the frosting I had purchased. I was planning to half this recipe but then I halved everything but the milk–curses! And had to go with the original size of frosting–which makes a ton btw. It was actually a blessing in disguise that I had so much frosting because I needed it. I had to make the roses several time because although the ones near the bodice of the stayed put nicely–Newton’s law of gravity worked on the ones pasted to the sides (I can’t imagine why the exclusion I petitioned for didn’t come through) and they kept falling (even after carefully freezing them and using more frosting as glue). All in all, it was fun to make. 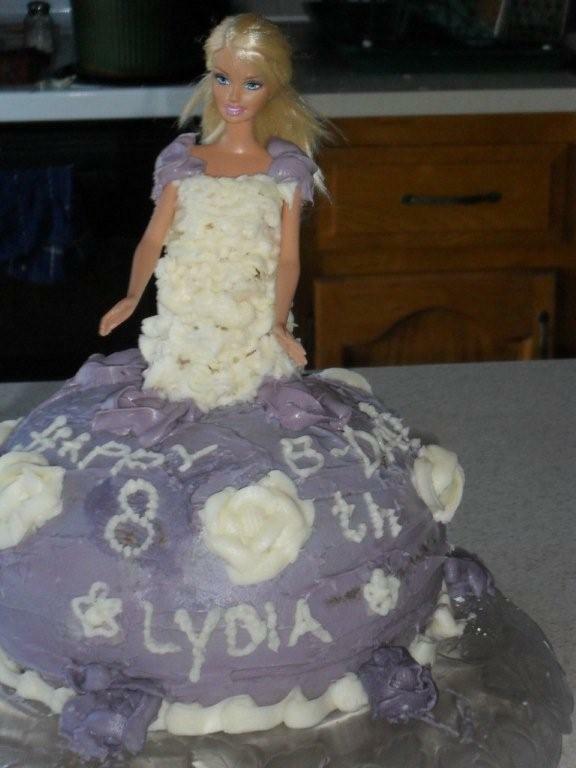 Lydia was happy with it and her little friends thought it was SO silly that Barbie was a cake and that I frosted her! My youtube wonder was a success–how did moms make it before the onslaught of the internet?